Dubai: Confidence crept back into Dubai’s market on Tuesday as the index breached key technical level amid interest in Emaar Properties and other heavyweights such as Emirates NBD and Dubai Islamic Bank (DIB). The Dubai Financial Market (DFM) general index built on its previous day’s gains of 2.3 per cent, to end 1.22 per cent higher at 2,729.86. 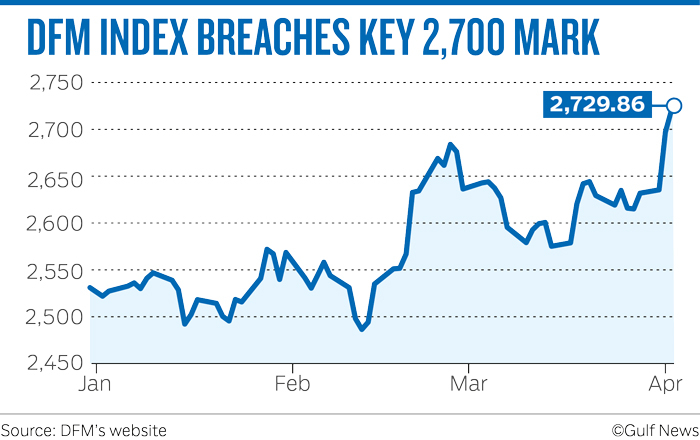 The index touched an intra-day high of 2,732.49, breaching a level it last touched on February 26. The value of transactions stood at Dh359 million, markedly higher that the 30-day average of Dh104 million. Emaar Properties, which has been on a winning streak since Thursday and has risen 13.5 per cent over the past four sessions, closed the session 3.22 per cent higher at Dh5.13. “We look to enter in stocks which are witnessing fresh bullish breakouts with recent lows as the stop-loss,” Shiv Prakash, a senior analyst with First Abu Dhabi Bank Securities (FABS), said. FABS has a technical sell on the share, whose initial target of Dh4.55 was met on Thursday. Dubai Islamic Bank (DIB) closed 0.41 per cent higher at Dh4.90 while Emirates NBD rose 2.38 per cent to Dh10.75. In the UAE capital, the Abu Dhabi Securities Exchange (ADX) general index slipped 0.04 per cent to close at 5,053.51. Adnoc Distribution advanced 4.05 per cent higher to end at Dh2.31 while the value of shares worth Dh4 million exchanging hands, up from the 30-day average of Dh1 million. Other indices in the Middle East also registered gains on Tuesday, with Saudi Arabia’s Tadawul All Share Index inching up 0.43 per cent to end the session at 8,934.69. The Tadawul index has been on roll since March 12 and has advanced 6.2 per cent since then. Egypt’s EGX 30 index, which has seen gains 5 per cent over the last four sessions, closed 1.4 per cent higher at 15,163.49. According to Kamco Research, monthly trading activity in the GCC region bounced back, with increases recorded in almost all the markets. The aggregate value of shares to change hands on the GCC’s exchanges increased by almost a third to $23.6 billion (Dh86.68 billion), with Saudi Arabia and Kuwait recording the biggest month-on-month increase. Menacorp said it is waiting for an upward retracement towards the Dh5 resistance level in DIB shares before it can reinstate short positions. First Abu Dhabi Bank Securities (FABS) said the trend in Emaar Properties is up and shares may head towards the 100 per cent Fibonacci extension level of Dh5.70 in the short term.